Once again, I'm being a little mean with my ColourPop posts, because these four eyeshadows come from the Holiday 2016 collection and are no longer available. 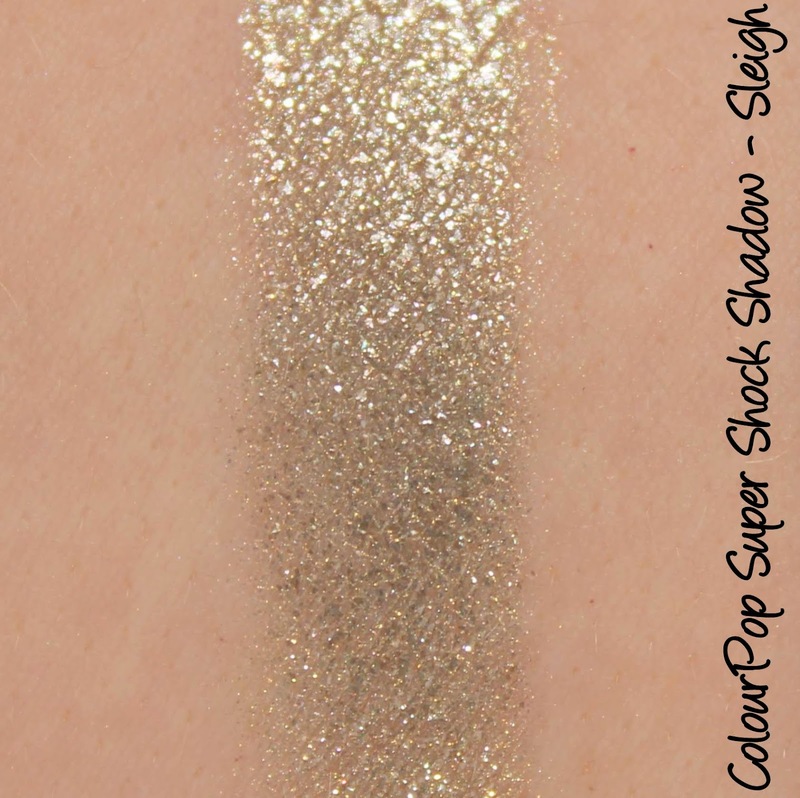 Three of the four shades were repromotes from previous launches, though, and ColourPop have been pretty generous with their rereleases of late, so maybe we'll see them again? Anyway, they're too pretty not to share, so let's dive in! There are eight different finishes in the SuperShock range: Ultra-Glitter, Glitter Sheer, Satin, Matte, Metallic, Ultra-Metallic, Pearlized and Pressed Pigments; I have a mixture of Metallic and Ultra Metallic shades to show you today. The Metallics are pretty much what they sound like: a super sparkly base, often with the addition of the glitter while the Ultra-Metallics step it up a notch with a more frosted base colour. 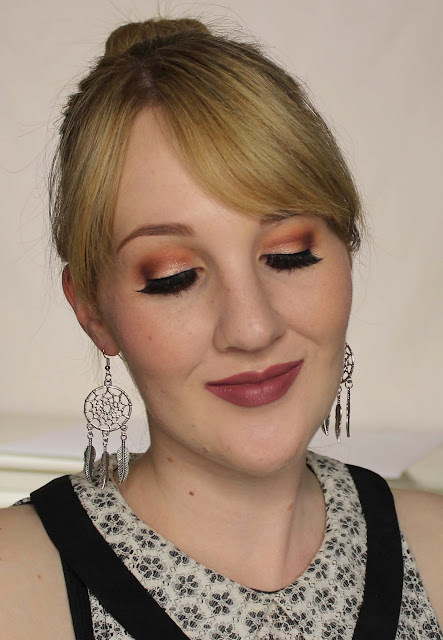 All of ColourPop's eyeshadows wear like iron on me, I can always rely on them to stay all day without creasing. Super Shock Shadows come in screw top jars, with the holiday collection coming in chic matte black instead of the usual glossy white. The boxes also got a bit of sprucing with a fishnet and floral design that renders my packaging-obsessed-self unable to get rid of them - although, with no names on the boxes, there's no advantage to keeping them either. Sigh. Koosh is described as an 'icy silver taupe' with an Ultra Metallic finish. This was the shade I knew I'd love without a doubt and I definitely wasn't disappointed! 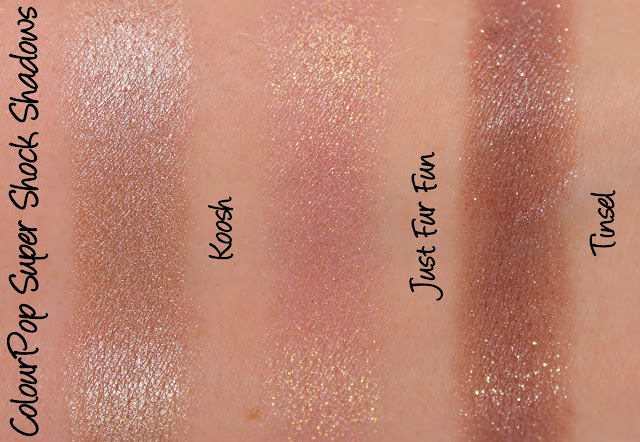 Koosh is incredibly pigmented and creamy, it applies like a dream. It originally came out with the Forever Freshman set in 2015. 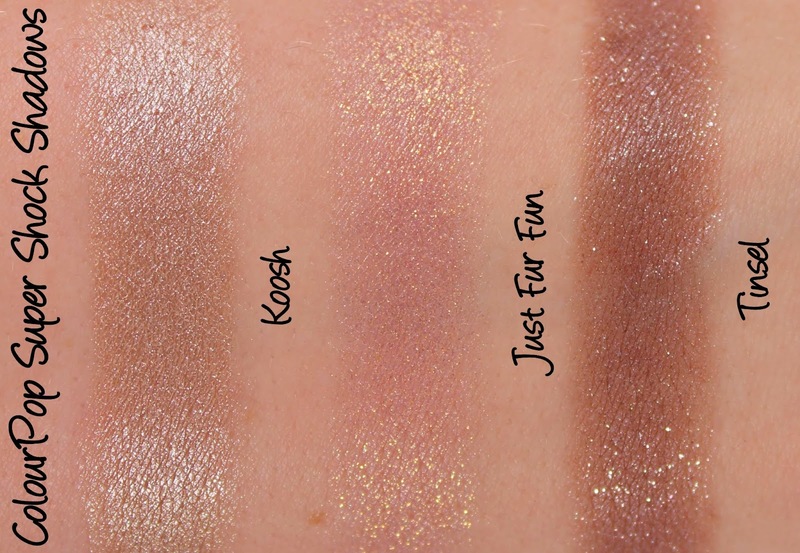 Just Fur Fun is described as a 'soft pink with a bright gold duochrome glitter' in a Metallic finish. 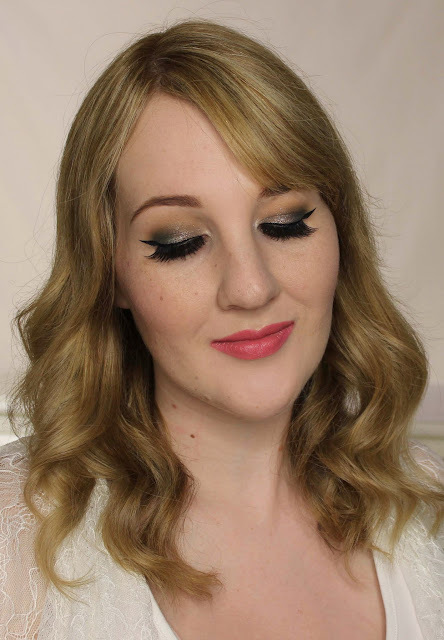 I was particularly excited for this shadow, too yet somehow it ended up being the last of the four that I used! Funny how that works out, sometimes. Just Fur Fun is a gorgeous semi-sheer glitterbomb that makes an excellent accent colour, although the base can be built up easily enough to use on its own, too. 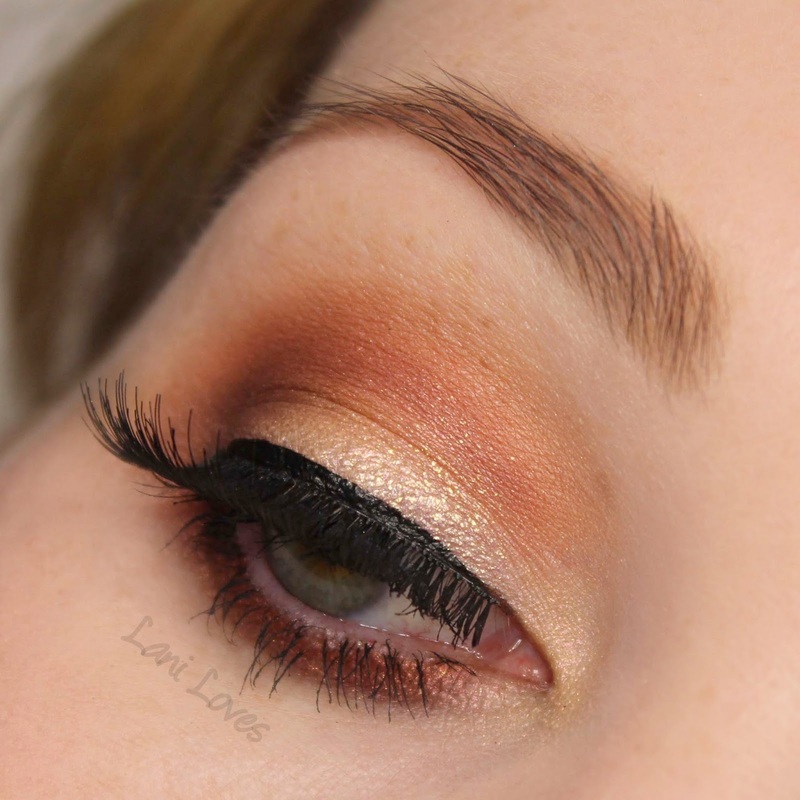 I really love it paired with By My Side in the look below as the base colours are similar on the lid. Tinsel is described as a 'grayed out icy lavender' with a Metallic finish. I'm not always a purple kinda gal but Tinsel has triggered a bit of a purple kick for me! Tinsel pulls a little taupe on me, which makes it really versatile and neutral enough to work for either warm or cool toned makeup looks. Application was wonderful as usual - I'm so glad I took a gamble and ordered this! Tinsel originally came out with the 2014 Not A Box of Chocolates set, alongside Sleigh. 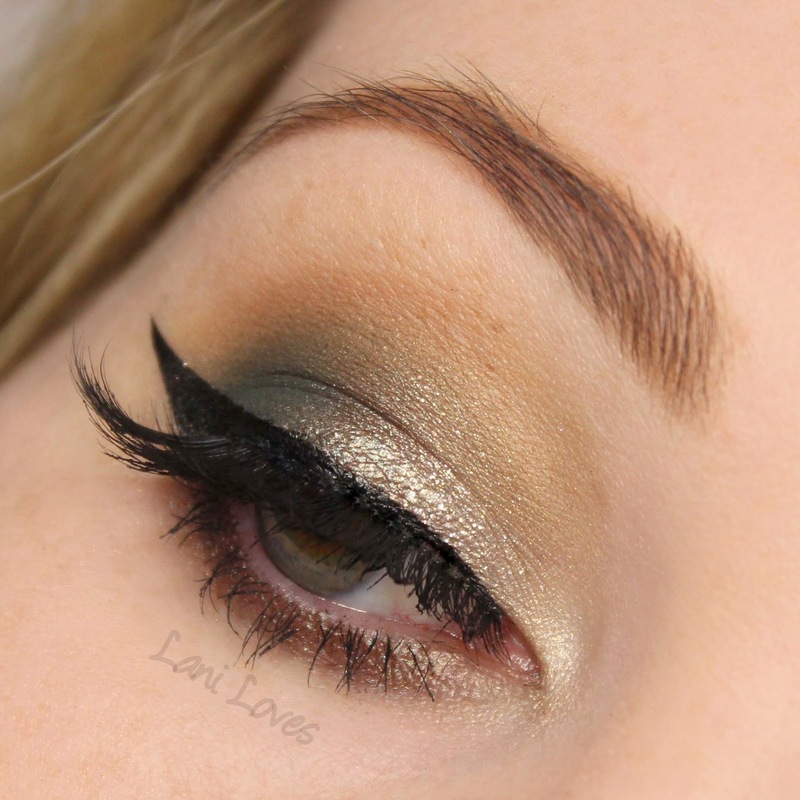 Here I've used Dark Lullaby on the outer half of the lid and lower lashline and Prunella on the waterline. I've also used some ColourPop eyeshadows: Tinsel on the inner half of the lid and lower lashline, I Spy for the transition, To-A-T on the crease and Fanny Pack highlighter on the inner corner. 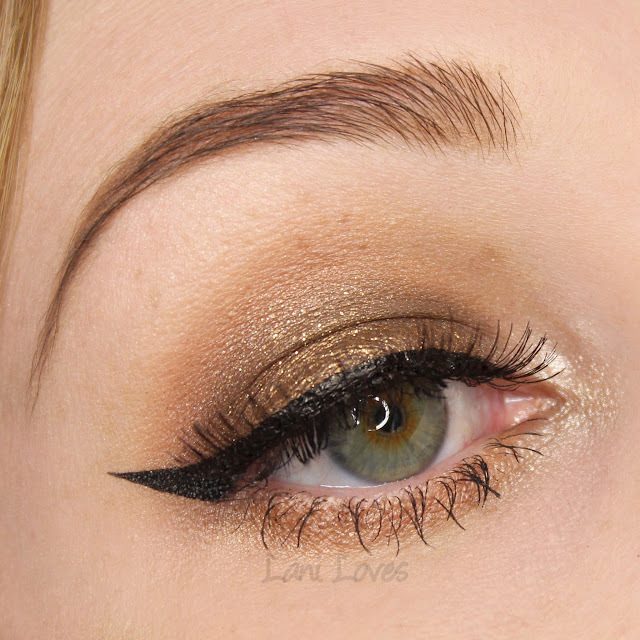 The lashes are Cala 1. 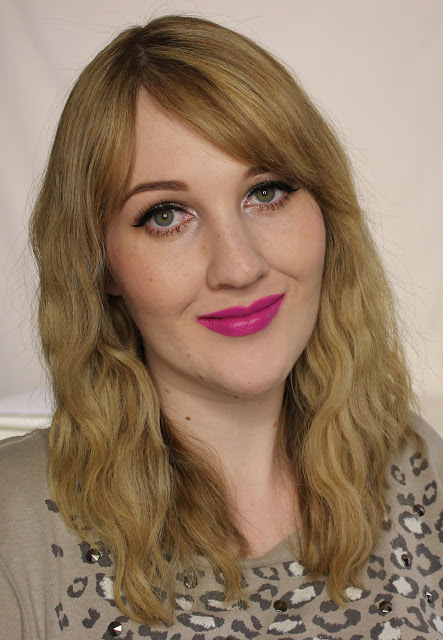 I'm also wearing Calypso Ultra Satin Lip in the pic below. Sleigh is described as an 'icy sage sprinkled with tons of multicoloured glitter' and has a Metallic finish. 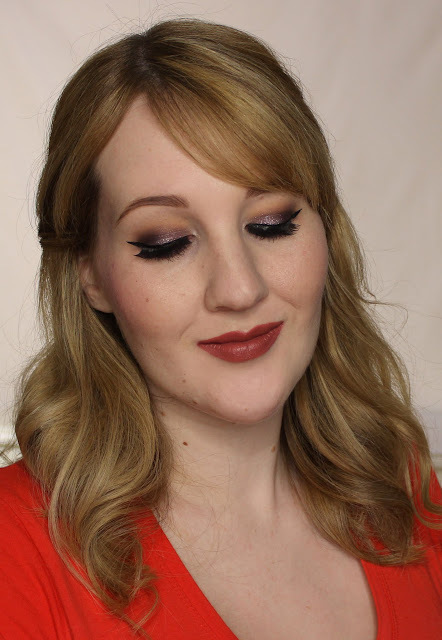 I skipped it with my initial order as I'm not usually mad on cool-toned greens, but when makeup looks with it started popping up in the ColourPop Fanatics group and the gold sparkles seemed to be pretty dominant I decided to give it a try. Plus, as we've established, I have trouble saying no where ColourPop is concerned! 😂 I wasn't let down, the heavy gold sheen and glitter make Sleigh a really interesting shade of pale golden-green; it's a bit of a chameleon and can pull more strongly either way, depending on what you pair it with. Again, no complaints on formula! Did you pick up any of these shades when the Holiday 2016 collection was available? Are you crossing your fingers for any of them to be rereleased?